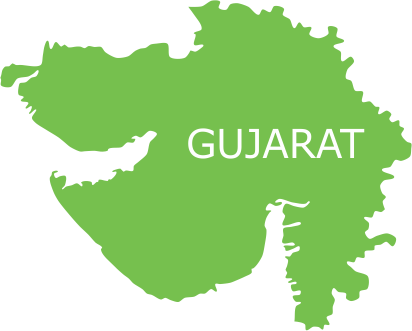 Ahmedabad is perhaps one of the most prosperous cities in India; yet, it has a large percentage of urban poor due to migration of labour from across Gujarat and neighbouring states. Census 2011 figures state that out of its total population of more than 5.5 million, almost 800,000 people are settled in slum colonies. However, this does not include a significant number of low-income groups and migrants residing in chawls, which were built as residential units for mill workers but have degraded into slums over time due to absence of a source of livelihood. Together, the two constitute a slum population of 1.5 million, which is the second largest in the state. The level of poverty, in terms of education and primary healthcare, is really low in Ahmedabad. Overcrowded and deprived of basic amenities like sanitation and drinking water, its slums are a breeding ground of diarrhoea, dysentery, asthma, malaria, dengue, typhoid, skin diseases and other health risks. Such poor living conditions in slums and chawls further push households into poverty as its people, working as daily wage earners and shopkeepers, are not equipped to fund treatment. Recent health studies reveal that deteriorating life in Ahmedabad slums has the most adverse effect on its women, the maternal mortality rate reaching as high as 64%. Studies have shown that access to good healthcare not just improves the health of the poor and destitute, but also leads them to a dignified living. Lack of it, on the other hand, deteriorates their diseased condition leading to higher mortality rates. In an endeavour to save lives and improve the quality of life of the underprivileged in Ahmedabad, Smile Foundation has joined hands with Deutsche Bank. Under this intervention, Smile Foundation is rendering its preventive, promotive and curative health services in 14 slums across the city including Gomtipur, Rakhial, Nagari Mill Ki Chali, Soni Ki Chali and CMC Mill. 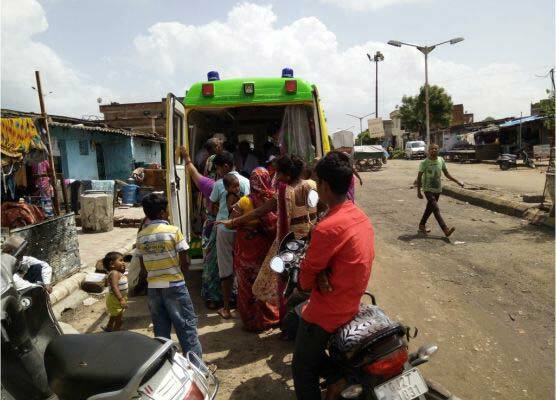 Through its unique mobile hospital programme Smile on Wheels, Smile Foundation is delivering primary healthcare solutions at the doorstep of families and children living under constant threat of water borne and vector borne diseases. This mobile hospital is staffed with a Doctor, Nurse, Pharmacist and Lab Technician to provide medical consultation, diagnosis, testing facilities and medicines to beneficiaries. There is also a Community Mobilizer on board who is responsible for enhancing health-seeking behaviour among slum communities through street plays, counselling sessions, audio-visual shows and other such IEC activities. Considering the increasing number of maternal and infant deaths, special meetings are conducted for women on diet and nutrition, ANC/PNC and immunization. General health check-ups, lab tests and medicine distribution conducted for free through regular OPDs and special health camps. Patients with serious threats to health referred to government hospitals to bridge the gap between the community and public healthcare system. Various awareness sessions conducted on basic health and hygiene, with special focus on maternal and infant nutrition, ANC/PNC and immunization. School health programmes, community meetings and IEC activities conducted to foster healthy living practices among families and children.